We arrived at the last night of Ramadan in most countries. So, what message for this year’s Eid should we convey to you? No, its not going to be a message of grief, sorrow, shame and weakness. That is not why hundreds of children were martyred. and those criminals came to see the bombing show for fun with drinks and popcorn. Their defat is certain by now. Gaza’s little children turned into shooting practice for israeli dogs. zionists took everything but they could’nt bend Gaza’s knees! That is the fact. And that is why Gaza won. the Mumineen won. and the bloody criminals lost. and so did the pathetic so-called muslim rulers squatting over Cairo, Riyadh, Amman, Baghdad and Damascus. And so did all those hyporcritical-celebrity-palace-scholars, whose income comes from religious commerce. And so did all those so called progressive-moderate-muslims, who wanted to make Palestine a humanitarian issue, they want it to be an issue for the UN and the Red Crescent, a theory which is nothing but garbage and time wasting nonsense. This is an issue for all the Muslimeen. Palestine, Al Quds and Al Aqsa belong to the Muslimeen and we will stand united for them all, like one body, even though the moderates, and the kuffar and the munafiq hate it. This Ramadan is not to be forgotten. This is the blessed Ramadan when over a 1000 Mumin were given martyrdom. In the last 10 nights most of the martyrs fell. May Allah Subhana Wa Taala have Mercy on them. Pray for those little kids who are now with wings flying in al-jannah, for those 4 little boys playing games with the angels in jannat al -firdaus, for those little babies who will be suckled by the angels, for those young men who will be washed by the angels, for those fathers and mothers who will be greeted with Salamun Salama! Ya Allah, these martyrs are an offering for you, please accept them, reward them in Jannah and let them meet their master Ar-Rasul Allah Sallillahu Alihi Wa Alihi Wa Sallam at the Fountain. Stay close to your family brothers, buy lots of gifts for kids, be generous in sadaqah and I wish you all Eid Mubarak. 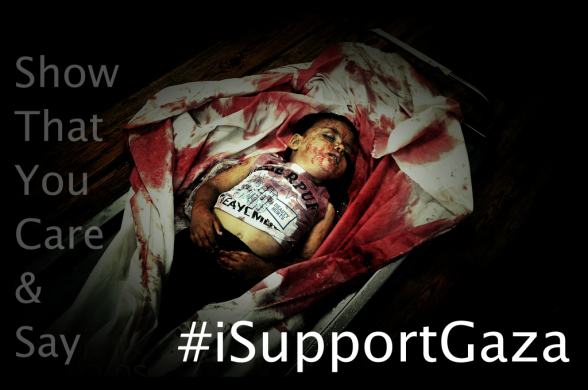 #GazaUnderAttack | SAY #iSupportGaza LIKE 440.000 PEOPLE WORLDWIDE DO! The savagery of Israel knows no limits in it’s ongoing assaults on Gaza. Acoording to the latest confirmed updates of the Ministery of Health in Gaza at least 720 people of whome over 80& civilians and many children are killed and over 4500 injured. 44% of Gaza-one of the most densely populated places on earth-has now been declared as a ‘No-go zone’ as OCHA reports. 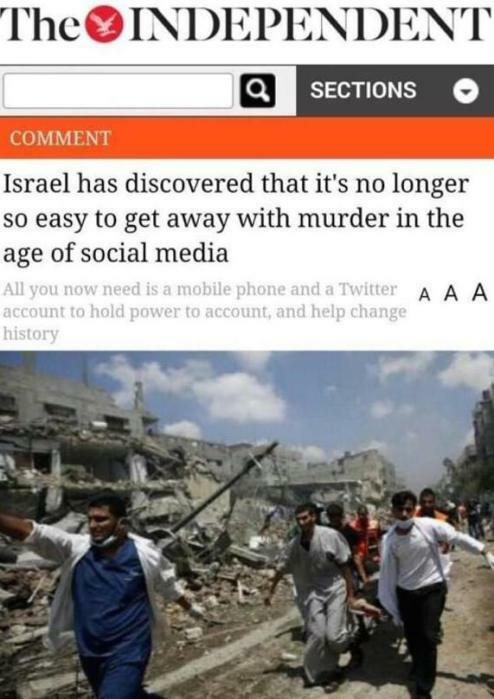 But Palestinians in Gaza have nowhere to go as Prof. Dr. Richard Falk wrote too. Update: 10:00 am Thursday: The child killed in the bombing of the mosque in Jabalia has been identified as: Hadi Abdul-Hamid Abdul Nabi, an infant aged 1 1/2. The death toll so far Thursday morning stands at 33 identified, but the number is likely to rise as bodies are being recovered from the bombing of East Khan Younis. #Egypt under #Sisi is a partner in crimes against humanity being committed in #Gaza. The military of #Egypt was the pride of the #Arabworld, now turned into the disgusting waste bin of the zionists. Shame on #EgyptianArmy on #Sisi and on all those who openly or secretly support the ruthless regime of the zionist supporter. TUNIS, (PIC)– Head of Tunisia’s al-Nahda party Rashid al-Ghannoushi revealed on Monday night that Egypt has refused to receive a Tunisian plane bound for Gaza loaded with medicines and medical supplies. Al-Ghannoushi told Al-Jazeera TV network that the Egyptian authorities had refused to allow the plane to land at the airport nearest to the Gaza Strip, pointing out that it was carrying medical supplies badly needed in the beleaguered Strip. The plane was supposed to fly back injured people who sustained serious wounds during the ongoing Israeli aggression on Gaza to receive treatment in Tunisia, he explained. Tunisian president Moncef Marzouki had declared a week ago his country’s intention to send a plane carrying medicines and medical supplies for Gaza Strip. #Israel’s crimes against humanity has sealed its fate. It will collapse as an unjust nation is forced by the power of nature to crumble in the wind of change. Here is a man who is giving terms to the occupier. You need to remember, #Gaza is locked from all sides by the Israelis. #Egypt too has closed the Rafah border, a heroic move from the former champion of the Palestinian cause! On the other hand is a nuclear power with the blind and unconditional military, political and diplomatic support of the lone superpower on this planet. It is the occupied and poorly armed #Palestinians who are issuing the terms and conditions for truce. When can a people have the confidence to do that? I guess only when they know they are on the right side, on the side of goodness and on the side of justice, only then can they take such bold steps. GAZA, (PIC)– Deputy chairman of Hamas’s political bureau Ismail Haneyya said Monday that the Palestinian people’s demands for ceasefire are clear: stop the aggression, do not repeat it, and lift the siege on Gaza. “We decided to end Gaza siege by our blood and resistance and there would be no return back”, he said. In a televised speech, Haneyya stressed that the Palestinian people are sacrificing their lives to end the occupation and its siege, saying that the Israeli enemy has failed to silence resistance. Israel is deliberately targeting Gazan civilians and children after failing to confront Palestinian resistance fighters, he added. “We waited for an international intervention to end an 8-year-old siege, but nothing changed. Today we decided to break the siege by ourselves,” he continued.